Bloggers Unite was an awesome event! It seems so long ago even though it’s only been a week.We all gathered at Misred Outfitters, talked, ate and had a good time. It was so nice to meet up with old friends and make new friends. Plus there is nothing quite like meeting people you only know via the internet. 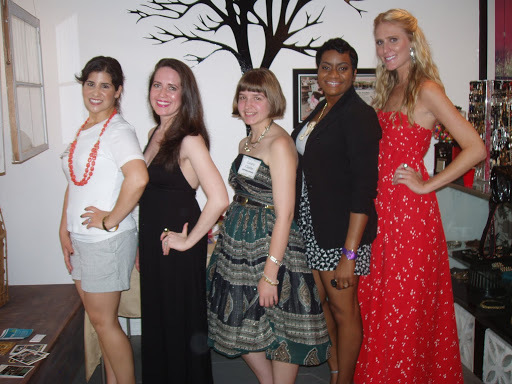 from the left: Jen of Belle De Couture, Prissy of Rush our Fashion, me, and Marybeth of Jade and Willow. 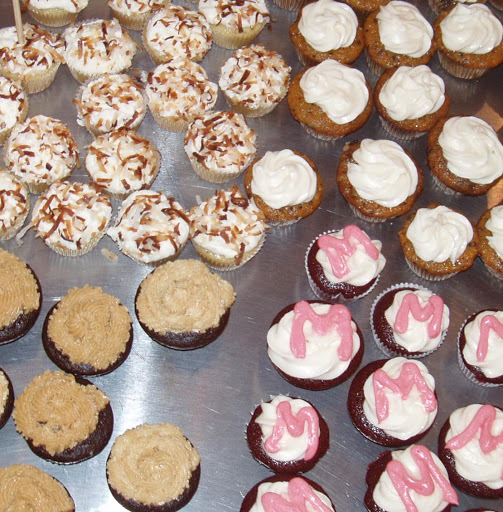 Delicious vegan cupcakes from A Yummy Kind. 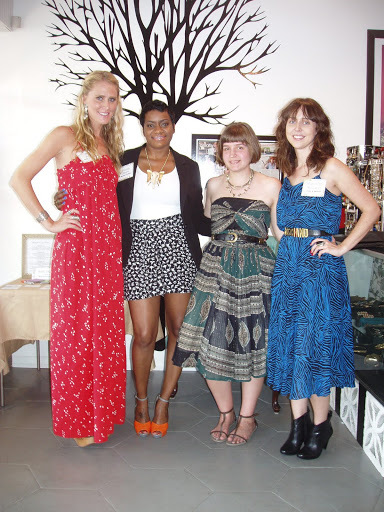 from the right: Annelis and Kristen of BonBon Rose Girls, me, Prissy of Rush our Fashion and Jen of Belle De Couture. Diane of Jade and Willow and me. Samantha of Samantha’s Garments, Jen of Belle De Couture, Diane and Marybeth of Jade and Willow, Avery of Trick and Spin, Myla of The Huntress, Prissy of Rush our Fashion, Kristen and Annelis of BonBon Rose Girls, Rachel and Rebekah of Eugenia Woods, Andrea of Window Shopping Diva, and Natalie of Forever the Hostess. Natalie has a wonderful post here. Samantha has several that I enjoyed, check them out here, here and here. Feel free to click on over to Jen’s post. Here is Kristen’s post. 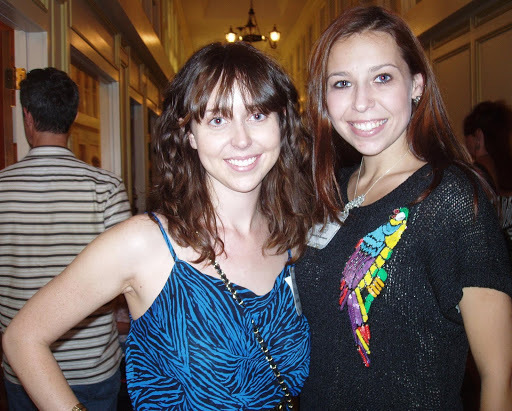 Rachel and Rebekah have a fun post over here. 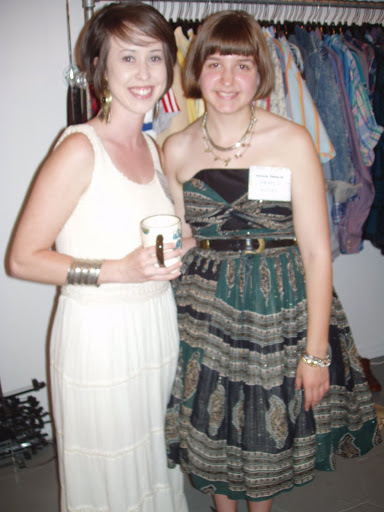 In addition to meeting all of these fabulous bloggers, I had the privilege of attending my first fashion show. It was fabulously fun, ten different stores each contributed four looks to the show, check out the video here. Plus read more about my friend Rosey’s part in it here. Thank you Sara, Jen, Natalie and A Yummy Kind for making this night such a hit!!! I hope you all are having a wonderful relaxing Sunday!!! p.s. Due to the high volume of home work brought on by the end of the semester and finals; I will not be posting again until next week. =( Unless a miracle happens… But I will be visiting all your blogs and commenting back as usual. I love events like this where girls unite and talk about what they love. Oh I am so jealous you got to meet all these awesome bloggers! I am loving the pretty dresses some of you wore and the fun nailpolish! Vegan cupcakes, yumm. It looks like a fun time. I love your dresss too. Looks like you had such an amazing time. goodluck with your homework and finals! gotgeous girls – gorgeous pictures! i wish i could go to something like this! the print of your dress is great, love the ethnic feel. this looks like so much fun! 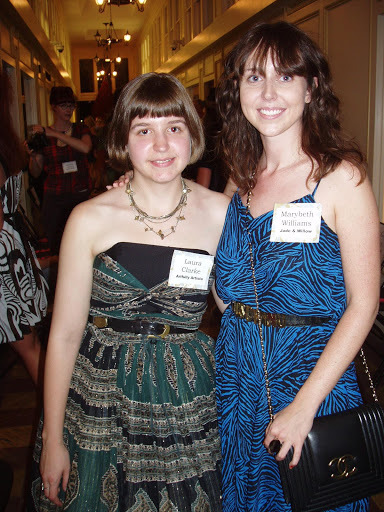 i bet it was great to meet other bloggers! beautiful long dress red ! You all look so beautiful!! 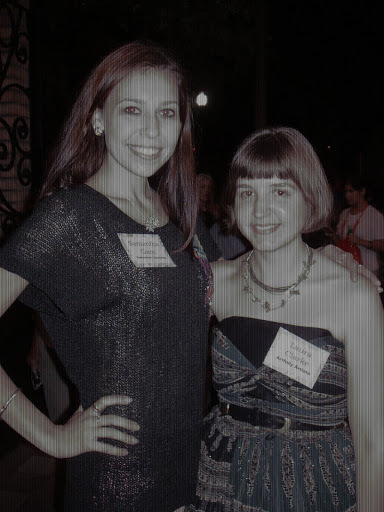 I am excited to meet my first bff via blogging in just 2 weeks! Ah! Love the women I'm getting to know through this great community. P.S I totally get what you're saying when you say things seemed like a while ago. I think that is due to blogging, I posted an outfit and was like, “oh man i'm so late on this blah blah” to the bf and he's like hey was only 4 days ago…lol. Blogging causes some kind of time warp I think. looks like a great time, everyone is so stylish and chic! Just came to your blog through lovely Leia's fb page comments. Seems like you had a great bloggers meet with cup cakes and fabulous pictures. You have a great blog. I should come here more often. Awww how fun !!!! 😀 Everyone looks great! it looks like you all had such a wonderful time! Once again I'm jealous…sad there arent many oregon bloggers. Such a great and happy bunch of bloggers. Good luck with homework and come back soon! I love it when virtual friends become real friends. You guys look great. Well hello there sweetie, long time no see, thanks for the sweet comment on my blog. Wow, love all those photos and I'm checking out those blogs, and they all look amazing!! Wow this looks like so much fun, love your dress, you look stunning!